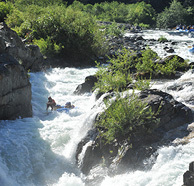 Description: The South Fork American river Gorge Run is our most popular 1 Day trip that we offer. It is perfect for first timers, families with kids 7 and up, and all different kinds of groups. Beginning in a mellow section of the river and slowly building until you enter the GORGE, where the rapids come one after another, with short pools in between to let you get your breath.There is even time for cooling off on a hot summer day in the river while floating along side the rafts. 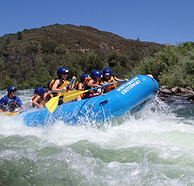 Itinerary: This trip meets at 10:00 AM at our Whitewater Excitement basecamp and meeting area in Coloma, CA. We then check you in, board our bus for a very short ride up to the launching area where you guides will meet you and help you with your river rafting equipment. After our river safety talk and orientation, we split up into groups, assign the guides and begin our rafting adventure on the South Fork American river. The Gorge Run, begins with some bouncy whitewater and even a out of boat experience through “Swimmer’s Rapid” a fun, small wave train that leads to a huge pond to recover in. A fun way to cool off in the hot summer. The river builds slowly and we then enter the “Gorge”, where the rapids come almost in non stop fashion for 6 miles. 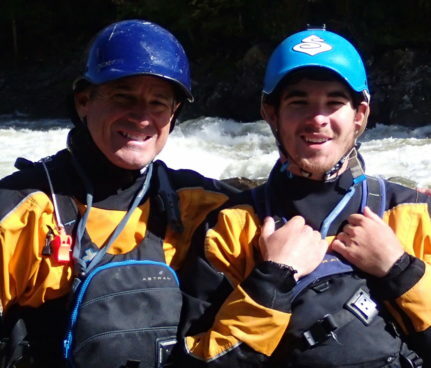 Many rapids make up the Gorge, but the highlight rapids are “Scissors”, “Hospital Bar”, and “Satan’s Cesspool”, where you will always catch a professional photographer capturing your rapid moment. There are breaks in between the big ones for us to relax and catch our breath before plunging into the next one. 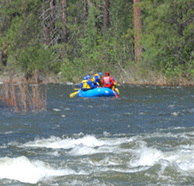 Wet Suits, splash jackets are provided during spring time rafting.